This version of apple crumble pie is an interesting alternative to the standard apple pie in a pie form. As the main difference here is, the pie is baked in a dutch pot. Then the layered effect of apples cooked with sugar and cinnamon. Once again layered upon with a crumble for the top. Not the best apple pie’s I’ve made visually, but the taste is quite warm and hearty. Additionally, I think it’s quite creative, which is why it’s made it to the post. Give it a run. See what you think! A quick, different alternative to the standard pie form…this is made in a Le Cruset dutch oven. In a Le Cruset ceramic lined iron baking dish, put the sugar, vanilla and cinnamon in the dish. Put on stove and turn on high. With the heat, the sugar will form a caramelized texture, and this is the ‘crust’ for the apple crumble. Do not stir, just let it melt and caramelize. While this is happening, shred 2 large apples, and slice 1 apple in chunks. For the shredding, leave skin and core in, and just shred. For the sliced apple, skin and core, then cut in small chunks. Once caramelizing has taken place, layer the shredded and cut apple. The juice from the apple will mix with the caramel, and just let it stand on the stove and cook-about 5-8 min. 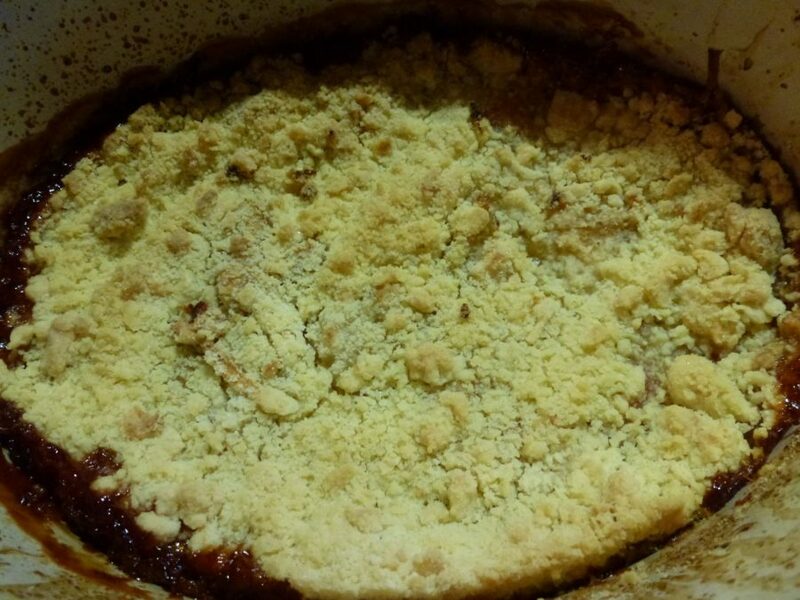 Meanwhile, begin to make your crumble, and preheat your oven to 200°C. Combine crumble ingredients and finger together until it’s crumble in texture. Layer the crumble on top of the apples. Let it stand until the lower ingredients boil or bubble. Place in oven and cook for 20+ min. or until golden brown.